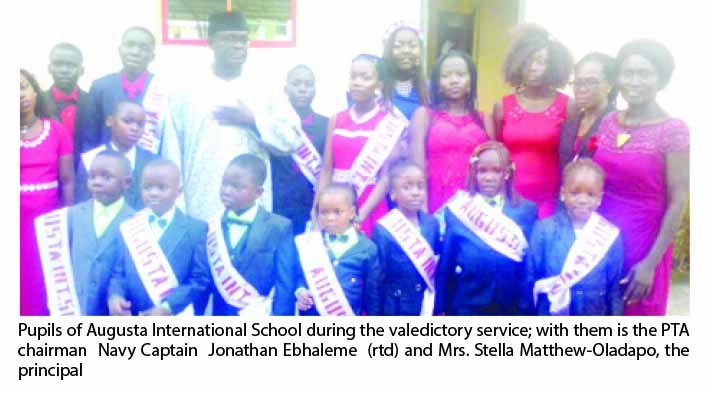 Forty-three pupils graduated from the basic, junior and senior secondary school arms of the school when Augusta International School, Lagos, held its valedictory service recently. Speaking on the occasion, Mrs. Stella Matthew Oladapo, principal of the school called on school owners to build self-confidence in their pupils rather than buying the services of mercenaries to write exams for them, boasting that this is one of the things that stand out Augusta International from other schools. Apart from this, she noted also that the school uses the British curriculum to prepare its students both for national and international exams. She condemned the idea of Nigerian parents taking their children outside the country to further their education, noting that some have lost their lives in the process. Mrs. Oladapo further called on government to provide facilities that will enable children to learn comfortably in the classroom, adding that it was the unavailability of facilities in public schools that made private owners to go into the business of running of schools, and in the process hiked the fees to enable them provide students with these facilities. Also speaking on the occasion, Navy Captain Jonathan Ebhaleme (rtd), chairman of the school’s Parents Teachers Association, charged parents to be concerned about the welfare of their children, especially, at the level where they are now, otherwise it would be more difficult to monitor their progress once they cross over into the university system. He called on parents to send their children to public schools if they cannot afford the fees being demanded by private schools. According to him, it is not the school you attended that matters but your will and determination to succeed. Not everybody who went to highbrow schools came out with good result, he said. On the other hand, there are others who attended the so-called low school and came out in flying colours and are doing better than their colleagues who passed out from elite school. If you passed through a system, he said, you should also allow the system to pass through you.